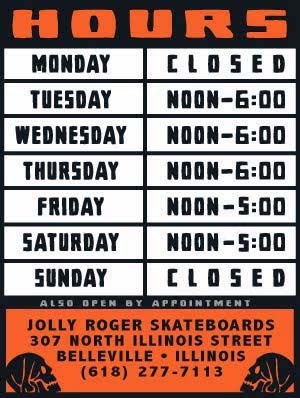 Since the shop is closed on Mondays we have been hitting up the Mill Skate Park in Granite City, Illinois consistently for the last few Monday nights and it has been pretty damn fun. No one is ever there on Monday nights so we have had the whole place to ourselves and it is only $4 to skate one of the funniest mini-ramps out of all of the local indoor parks. I may be biased though because I have skated this ramp in one form or another for the last 10 years. It used to be a vert Ramp at Six Flags when Tony Hawk rolled through one year, then it ended up as the spine ramp at the original Ramp Riders. I actually got the ramp from Tom and it was in my backyard for a while before we moved it to the back room of the the Big Top Skatepark in Belleville. After I left the Big Top Skatepark it stayed there and changed hands a few times. It has been hidden away since then at the Mill Skatepark and is still super fun to skate. Since the most people that I have seen there on a Monday night has been about 6 people and they have all been over 30 I figured why not call on other old men (or anyone that likes a good mini-ramp session) in the St Louis area to come out and join us on the East side on Monday nights. This park has seen better days and some of it is a little sketchy, but well worth the $4. For info on the park you can check out their myspace page but the pictures have not been updated and it is not the same set-up in the pics. Some of the ramps could be fixed up a bit but they also have a pretty nice quarter pipe mini in the back that is about 5 feet tall that is pretty fun too.